DEEP BLUE CREATIVE IS A LOGO DESIGN AGENCY BASED IN BALTIMORE, MD. We craft intelligent logo design solutions that connect small brands with their intended audience. Though our core strength is logo development, we provide a wide range of brand communication services such as print design, social media marketing, and web consultancy. Equally Yoked Introductions commissioned us to create their logo/brand identity as well as printed materials and sales deck. Because this was a new venture for the client, we were given total creative freedom to develop a sophisticated, flexible, mark that would be used across many mediums including printed advertisements, web advertisements, email signatures, and printed business collateral. Equally Yoked Introductions Email Marketing Campaign. Bikkle is Caribbean food that speaks to the foodie via an experience where patrons can only expect the unexpected, an experience that connects the cultural dots between the Caribbean islands while re-imagining, elevating, and presenting new perspectives that reference deep traditions. We were commissioned to provide an iconic logo that would stand the test of time; simple, impressive, unique. The owners of HERBn Life came to us with passion and excitement for their brand., and ultimately the awareness they could bring to the masses regarding the benefits of CBD and THC products. Eager to break the stigma that has been associated with THC, HERBn Life needed to feel clinical, scientific, and medicinal, to reflect the changing tides. The design needed to be flexible enough that it could work on a hoodie, emblazoned on accessories, or even in a corporate setting. JFON Houston provides low income individuals and families with affordable, high quality immigration legal services. They also train volunteers, attorneys, and communities of faith to help carry out their mission and advocate for the rights of our immigrant neighbors. In 2017 they provided advice and counsel to more than 225 individuals across two clinic locations. Case types included Work Authorization, Family Unification, Fleeing Violence, and Citizenship. 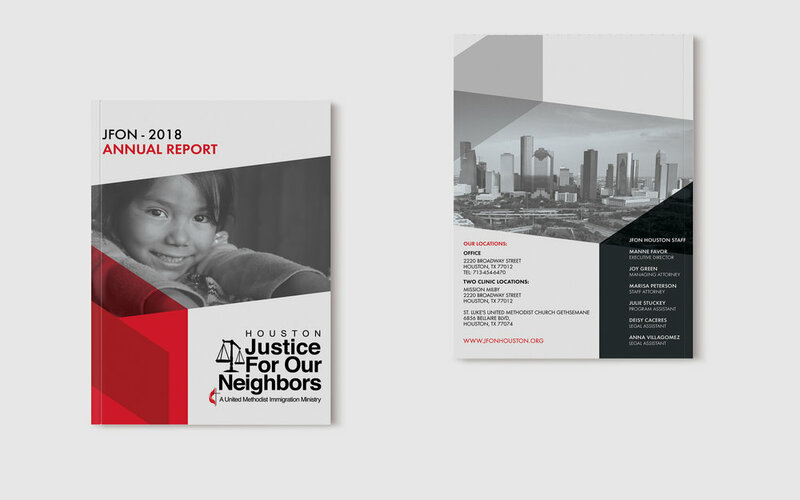 JFON Houston commissioned Deep Blue Creative to design their annual report to communicate the year’s progress and achievements to their stakeholders.